From the records, it appears that most of the windows of the old church, except the Chancel, had stained glass in them, but there was more yellow than any other colour. The little window in the gallery had a coloured border, with plain glass in the middle. 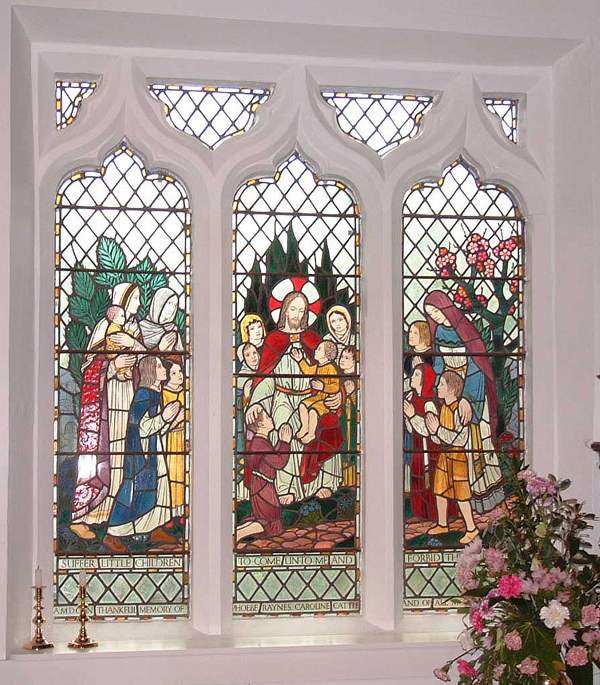 In the modern church, the 19th century windows of the Chancel are typical of their time. The large three-lancet east window, with crimson and ultramarine predominating, has the Crucifixion as its central subject, surrounded by scenes from the life of Christ – themes which have been used over the centuries in our parish churches. The chancel was erected to the Honour and Glory of God by Mary Buttle Radford, wife of John Radford Esq of Smalley, 1863 and the single-light chancel window in the north wall contains a stained glass figure of Christ and the legend: “Behold I stand at the door and knock”. Opposite to it, in the south wall, a stained glass window of two lights depicts, on the left, the Raising of Lazarus, and on the right, Christ appearing to Mary Magdalene. Under the two windows runs the legend: “Blessed are the dead which die in the Lord”. Beneath this window, at the level of the altar rail, is a brass plate which records: “In memory of John, the eldest son of John and Theophila Radford, who died March 29th, 1866, in the 88th year of his age”. In the south aisle, the more easterly window commemorates Mary Buttle Radford, who died on August 1st 1882. It has three lights each containing a large figure, delicately drawn in the Pre-Raphaelite style popular a century ago. On the left is Faith, holding a cross, in the centre is Charity, with two children, and on the right, Hope, with an anchor. The other south aisle window was designed and completed entirely by the Reverend Charles Kerry in memory of his beloved parents, Samuel and Elizabeth Kerry, who died in 1882 and 1869 respectively. Their names appear in the small lights at the head of the window, while a Latin inscription across the foot of the panes tells that he made the window himself in 1896. The figures in the lights show St Diuma on the left, St John the Baptist in the centre and St Chad on the right, all with inscriptions in Latin. This window was the first to be created by that man of many talents, the Reverend Kerry. He subsequently designed and executed further stained glass windows, which are in the parish churches of South Wingfield in Derbyshire and Shillington in Bedfordshire. The window in the west wall, near the doorway and in the Corner of Remembrance, is inscribed: “In Memory of Alice Mary Fletcher, 1891-1970”. The illustrations in the window symbolise our Lord’s triumph over death, with the Crown of Victory above the Cross and the Crown of Thorns, with the spirit of God descending as a dove. The Maltese Cross is the symbol of St John the Baptist and the wheatsheaf is the agricultural reference to the occupation of the donors. The waters at the base illustrate a well of water springing up into eternal life. The other window in the west wall, near the Choir Vestry, depicts all the musical instruments mentioned in the Bible, together with the lettering: “Make a Joyful noise Unto The Lord”. This window is in memory of Herbert Harrison Dix, 1883-1972, who was for many years organist and Choirmaster of the church, Headmaster of the Richardson Endowed Boys’ School and Secretary of the Parochial Church Council. “AMDG In Thankful Memory of Phoebe Raynes, Caroline Cattle and of all Mothers, April 1951”. “SUFFER LITTLE CHILDREN TO COME UNTO ME AND FORBID THEM NOT”.